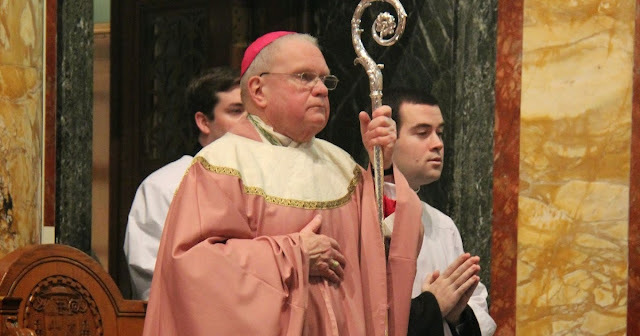 Obituary from Boston Pilot: Bishop Walter James Edyvean, titular bishop of Aeliae and former auxiliary bishop of the archdiocese, died at Metrowest Medical Center, Natick on Feb. 2, 2019. His death at the age of 80 was unexpected. Bishop Edyvean would serve as the archbishop's second in command, as vicar general and moderator of the curia; while Bishop Lennon would remain as rector of the seminary and assume additional responsibility as regional bishop of the West Region of the archdiocese. At the time of his episcopal ordination, he assumed both a coat of arms and a motto. Bishop Edyvean chose a line from the martyr bishop of Carthage, St. Cyprian: "Christi nihil praeponere" -- prefer nothing to Christ. In December 2002, with the resignation of Cardinal Bernard Law and the appointment of Bishop Lennon as the apostolic administrator of the archdiocese, Bishop Edyvean remained on board to assist his former student in the governance of the archdiocese in a most trying time. Following the installation of Archbishop Seán P. O'Malley as the archbishop in July 2003, Bishop Lennon was named vicar general and moderator of the curia, and Bishop Edyvean named bishop of the West Region where he served until his retirement as auxiliary bishop on June 29, 2014 -- the 13th anniversary of his appointment as bishop.